A major contributing factor to a successful military operation is proper logistics as it is the backbone of military support. This handles the supply, movement and maintenance of an armed force for both in peacetime and under operational conditions. Now, industrial-grade computers are being used to improve military logistics operations. It has the capability to withstand the harsh environment of the military industry. These computing devices are also integrated into the operations because of its flexible mounting options and long-term availability. What’s more, this device also features a projected capacitive touchscreen technology. This type of touchscreen technology has multi-touch functionality. Plus, it is resistant to surface contaminants such as water, dust, dirt and fallen debris. Thus, it is an ideal computing solution for military logistics. So, how can this device provide efficiency and long-term availability in the military industry? Read through this blog and know the essentials of utilising industrial PCs. Military logistics is the support line of the military. And, note that a typical computing system could not endure the extreme environment of military logistics. Hence, technological advancements such as industrial computers are being used to optimise its military operations procedures. Installing this type of computing technology makes it easier for operators to streamline their logistics plans. Panel PCs with projected capacitance are also scratch-, dust-, and water-resistant. So, expect that this device can function well in the military operations. Industrial PCs featuring projected capacitance technology can offer an ease of use to operators in military logistics. Its touchscreen functionality enables the operator to efficiently navigate a program. Users can apply different touch gestures such as tapping, pinching or swiping on the screen monitors. Therefore, it helps in speeding up the operations in military logistics. 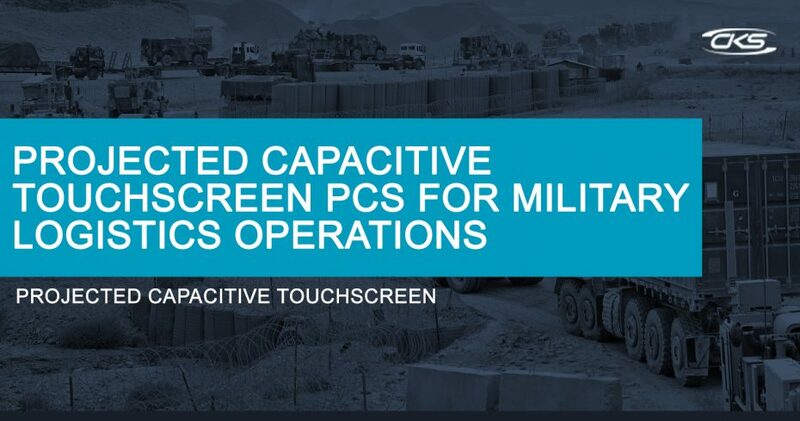 What makes a capacitive touchscreen PC an ideal option in this field of military operations? Here’s a list of advantages of using this technology. In a field where every second count, it is critical for the military to have a user-friendly interface for easy navigation. Panel computers with a projected capacitive touchscreen have multi-touch functionality. It is more responsive to touch as its sensors can detect several touch points. Thus, operators can easily utilise any military applications program by touching the icon displayed on the screens. These devices are built for military usage. It is sealed with the highest degree of protection available for a device, allowing operability even under extreme conditions. It is resistant to dust, oil, and moisture and, at the same time, continues to be responsive even with the presence of potential risks. The high-grade sealing protection eliminates the worry of hardware malfunction due to exposure to harsh conditions. This guarantees that the device can be used by military personnel even in an extreme environment. An essential characteristic of this computing equipment is its high-quality display. This device is made of an optical bonding method which makes the screen easily readable even under bright ambient conditions. This means that it is definitely ideal especially for outdoor operations because it offers excellent image clarity. A well-organised and efficient military logistics operations are vital in the military industry. And, it also bears a fast-paced working environment. Now, with the advancement of technology, ruggedised PCs are becoming an ideal choice because it helps in making operations efficient. Plus, it can also be conveniently used for outdoor missions because it is resilient to shock and dust damage. Consult an industrial computer expert today to check out the best industrial panel PC for military logistics operations.